The Real Rosewood Foundation, Inc. The Real Rosewood Foundation was created in 2002 to develop a timeline, expand the search, find lost survivors, and locate descendants – black and white, inviting cultural participation to preserve an important history. Though it has been ninety-two years since the massacre, the descendants are still in touch with their beginning. Each year in July they celebrate family reunions. They are not angry and do not dwell on the past destruction of their hometown. Choosing to attain higher learning, many have gone on to become educators, doctors, lawyers, engineers, superintendent of schools, and skilled workers. They never lost the work ethics and values instilled in them by their ancestors. A most recent development regarding Rosewood is the interest of white Rosewood descendants in helping protect the history. This foundation is dedicated to building the Rosewood Black History Preservation and Research Center in memory of the Rosewood survivors and descendants at Mahulda's Archer, Florida homestead. Additionally, the foundation sponsors a scholarship in honor of Mahulda Gussie Brown Carrier, the third Rosewood schoolteacher employed in Levy County. Carrier is the first and only black female principal employed in Levy County and is believed the second black female principal hired in the state of Florida . 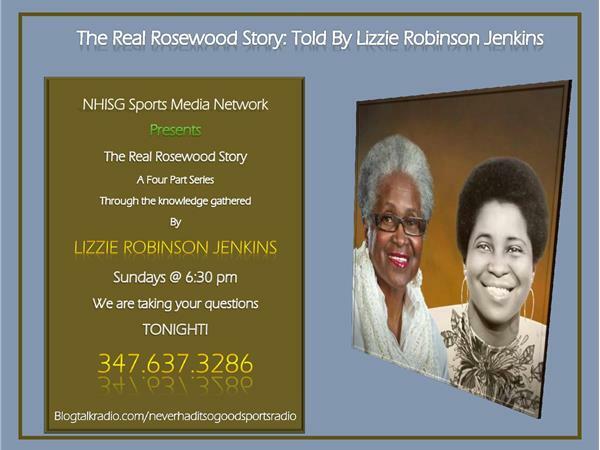 The foundation is working to produce a documentary recapping real truths by historian Lizzie Jenkins, founder and president of The Real Rosewood Foundation, who is writing her life story which includes how she unlocked the secrets of Rosewood through consistent research. Moreover, the foundation is producing two songs, "Rosewood Florida" and "Rosewood, No More".